Does Novak Djokovic sweat? In the abstract, it’s a ridiculous question. He is human; of course he does. But then: does he? 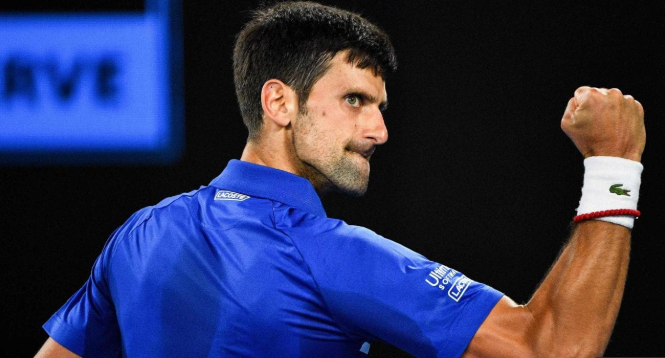 Rafael Nadal’s culling up oceans out of his own pores may have made the contrast even starker, but not once did it ever appear that Djokovic was on the way to even letting a single drop reflect the light of night. Perhaps surprisingly, coming into the final, Nadal was the one who’d looked stronger on his way. He hadn’t dropped a single set and had only faced one tiebreak, in the fourth round against Tomas Berdych. In his 80 service games coming in, he had only been broken twice, both of which were in the first round. Coming off an up-and-down 2018 in which he’d ceded the #1 ranking to Djokovic following knee and abdominal injuries, Nadal looked rejuvenated. It took all of three games in the final for Djokovic to upend that, holding twice and breaking Nadal’s first service game of the match. Djokovic’s dominance in the first three sets was so explosive that it looked more like the person who first invented tennis was teaching his first-ever student and less like a major tournament final between the top two players in the world. This, I say with the utmost respect for Rafa, who is more perpetually in-shape than anybody in tennis history as well as, of course, being the greatest clay court player ever. Rafa’s problems were threefold: one and two were that he was facing probably the greatest returner in the game, on that guy’s preferred surface and at his best event. Three was that the first time Nadal looked at all in control of himself, and one of only a handful throughout the match, was when he served already down 5-2 in the first set. As good as Nadal has always been when playing with his back to the wall, this is, err, not a recipe for sustained success. Not unlike in the women’s final the day prior, this match showcased the extensive contrasts between its participants, though we’d seen them many times before: Djokovic knows not how to waste a single movement, while Nadal makes calling for a towel look like the final 100 meters of running a marathon in combat gear. Nadal’s forehand looks like he’s cracking a whip in a John Ford film, while Djokovic looks like the generic – but technically correct! – standard character setting of an 8-bit MS-DOS computer game about tennis. In a match in which he already had no room for error, Rafa struggled mightily at the net; by midway through the second set, Nadal had already quadrupled Novak’s unforced errors, 16-4 (that would finish at a nearly-as-damning 28-9). Djokovic won 5-of-8 break points; Nadal forced the Serbian to face only one break, which he failed to convert. The repeated shots of Rafa’s box, full of stolid faces watching a canoe drift out into the lake, said it all. In an effort to stay in the match, Nadal got creative, breaking out his “banana shot” a few times with some success, but for each of his successes, he find a new thread to pull on his own sweater. He attempted several drop shots, including a handful immediately following a Djokovic drop; to no one’s surprise, the latter worked much more consistently than the former. At one point in the second set, Nadal tried two straight drop shots to Djokovic’s one, launching the second over his opponent’s head and, to his consternation, out of play. Nadal’s overarching disappointment even made itself evident in Djokovic’s few errors; surely, Rafa would have preferred to claim a few more winners of his own rather than amassing points as all but a courtesy from the other side. Despite how tiring he makes it look, Rafael Nadal has always wanted to win rather than not-lose. Djokovic, on the other hand, was going to win, and he was going to make it look exceptionally easy. He ran Rafa ragged, alternating courts with each shot within a point only until Nadal anticipated the shot, at which point he would fire a winner right to where his opponent had just been standing. It was confounding, and it must’ve been frustrating for Rafa; to watch it in real time was to experience Novak’s unique genius on this court. The criticisms of Djokovic’s match in this case are minor, in any case. Maybe he overplayed the occasional point, or tried to get too cute with a volley, or spent too much time wondering whether the crowd likes him or not, no matter how he’s doing. These are trivial in the grand scheme of this match, and this tournament. It was hot in Melbourne; it’s the summertime there, after all. The heat can get to you. It can make you second- and third-guess yourself, and that’s only the start. For Rafael Nadal, it was a pleasant surprise to have made it back so quickly at all. Roland Garros awaits, after all. But for Novak Djokovic, to reel off a third straight major and a first Aussie Open win in three years, this is a golden period, right on time, at age 31. It can’t get any hotter than this.